The comments on Part I are appreciated and I say again that it was only an aggregation of the views held by many others – NOT my personal view on Wenger. I would like to point out Mr. Victor Thomson as one of the most civil people I have ever had a disagreement with. Sir, I do not agree with most of what you say but you are the kind of person whose right to present their views I will champion at all times. I must, jowever, refute your view of Wenger staying put because he has a deal with Kroenke… I do not think that is the sort of person Wenger is and neither would you if the team were winning. What has Wenger ever done for the club? Firstly let me provide you with some reading you may find interesting on the matter. These are some of my favourite pieces debating very near to this topic. Not all of them are unbiased and some of them are very old but all top notch and worth a read. Take your time to look through them please. Most of those pieces have taken very different looks at the man and his achievements here at our beloved club and all have both bad and good things to say. I covered the bad in the Part I so this will mostly be about why I still want him at the club. First and foremost, it must be said that Arsene’s is one of the only footballing philosophies currently operating in the world. Although being a philosophy it is at times impossible to play out and doesn’t always get the result needed, but in him we have a man of gigantic footballing stature. One whose ideas have transcended cultures to impress people, even in England, where functional football is more the lay of the land. Having him at the club means we have a recognition for it worldwide, and that helps both the fans and the club in that we are proud of our image and we can attract the best players in the world. They come to play the beautiful game: the slick, technical, intelligent and intricate game that our teams play year after year despite not having the best results to show for it. Think of this for a second: 6-7 years down the austerity period, if Wenger had caved in to every doubter and the team started playing more functional football (read: defensive and/or danger free – a la LVG), would we have been able to sign the players we did even without trophies? 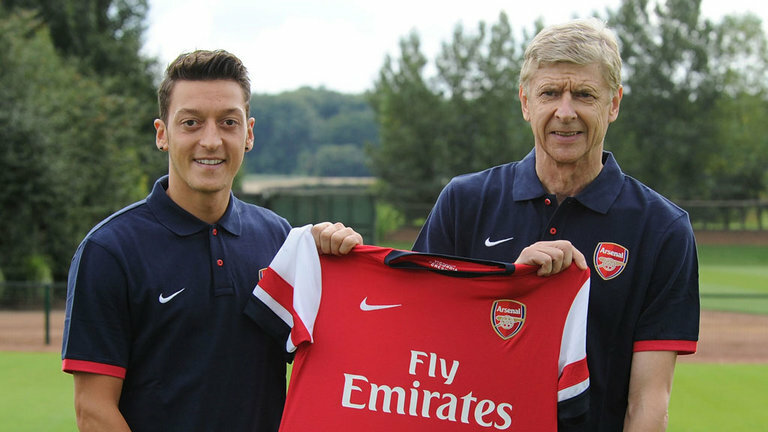 Would Mesut Ozil have come to us? Would Alexis Sanchez have come to us? Heck, would Santi Cazorla have come to us? And in the austerity period we played that way with a less talented squad (to say the least). For example in 2011 the team that lined up against Barcelona and won had the following starting XI: Szczesny, Eboue, Koscielny, Djourou, Clichy, Song, Wilshere, Fabregas, Walcott, Nasri, Van Persie. Subs: Almnia, Rosicky, Denilson, Squillaci, Arshavin, Gibbs, Bendtner. The scoreline that night was 2-1 to Arsenal, and that goes on to show the magic of Wenger’s man management and also his ability to make a team whose sum total was much greater than the sum of its individual parts. That is an outstanding achievement for any manager and we have done that again and again with Bayern Munich too. 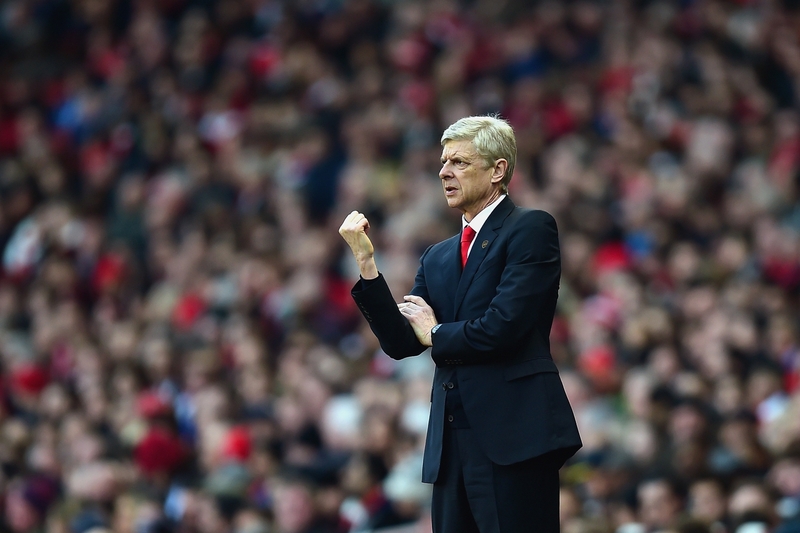 It has become expected that Arsenal can beat the big guns but falter at the final hurdle. People only see the faltering at the final hurdle, they do not see the fact that beating a super heavyweight requires much more from the team than they would usually have and that extra comes from none other then Arsene. Sports teams are expected to perform linearly, which is why champions are touted as favourites (HAHAHA. Chelsea) the next season; and players are selected right from a young age based on what growth they can show under observation (Jackie Wilshere) – linearly, that is. Whether performances can be sustained, or even growth can be kept on track, is impossible to foresee. However, Wenger has made a habit of producing non-linear results, whether a shock win against Bayern or a shock loss at Southampton (which should not be a shock really, it is not that bad a team). It also works the other way around – but then I can tell you that football teams do lose and since nobody has gone entire seasons unbeaten consecutively in modern day football, we can say that expectations are not always met. It all depends on what your expectation from the club is. My expectation is that the club keep playing a certain way and keep the class they have always had, which allows all of us to have the faith that we support a club that believes in doing things right. The trophies he has given us are known by everybody, but nobody understands the magnitude of his achievement. This is the man who gave us The Emirates Stadium, the man whose brain and tactics kept us in the fray of England’s top clubs at a time when money was just starting to make its way into the PL. He has foreseen the inflation of fees and the Emirates is the only reason we can still compete for signings with the big clubs and from next season, with basically all 20 teams in the league with the crazy TV money going in. When all clubs can give players the same wages, what do you think would pull them to a club? If you answered history then I must tell you that Liverpool are not doing well at all with history alone – and neither are Manchester United at the moment. I have never supported the Arsenal for trophies, simply because they did not win too many when I started watching them. For the first 8 years of my support they won absolutely nothing and I had no complaint about that. Supporting a team is being part of a narrative and I believe that our part in the narrative is that of the good guys. The guys who play fair and play for perfection, without any oil money and without ridiculous wages. We stand up for our own with the likes of Diaby and Wilshere, and although even I would say it was foolish for us to carry them on for so long, it speaks to a certain mentality from the manager. Arsene Wenger is a man of his word and has brought honour and repute to the club in a way that nobody else has in the past few years that I have known football. No other manager apart from Alex Ferguson is so easily identifiable with a club as Wenger is, and he wasn’t always well known in the good way. Let us get this clear, I am not saying we should not want trophies or that fans who want Wenger out are wrong – but just that I would personally rather have him at the club than have a David Moyes-like situation occurring here. People who believe Wenger should be gone believe that we are stagnating under him and that the same things keep happening year after year. While I do not subscribe to that view I understand why it makes sense to such a large contingent of supporters, but I should also point out that if you think results are stagnating then that cannot always be blamed on Wenger. Players underperforming cannot be down to the manager all the time. If the Arsenal juggernaut derails every year and you think it is because Wenger doesn’t have the winning mentality, just remember that this is the same man whose pursuit of perfection was such that he said an entire season unbeaten was possible, and then went on to make it possible. I have felt the need to respond to some of the comments on the last post because they deeply injure my image of Wenger as a man. Especially those suggesting that he has made a deal with Kroenke to keep quiet and earn his millions on the sly. I am sorry to say that such claims disrespect and defame our manager in ways that nothing else would. I understand people are more attached to the club than to Wenger but he is part of the upholstery at Arsenal now and will be even after he retires, one cannot make such accusations without cause. Wenger loves this club and it is fine that he takes a huge salary, because one can do both without a conflict of interest. He is running an enterprise worth $1.4 Billion and it must have its perks, one cannot expect him to be earning peanuts. 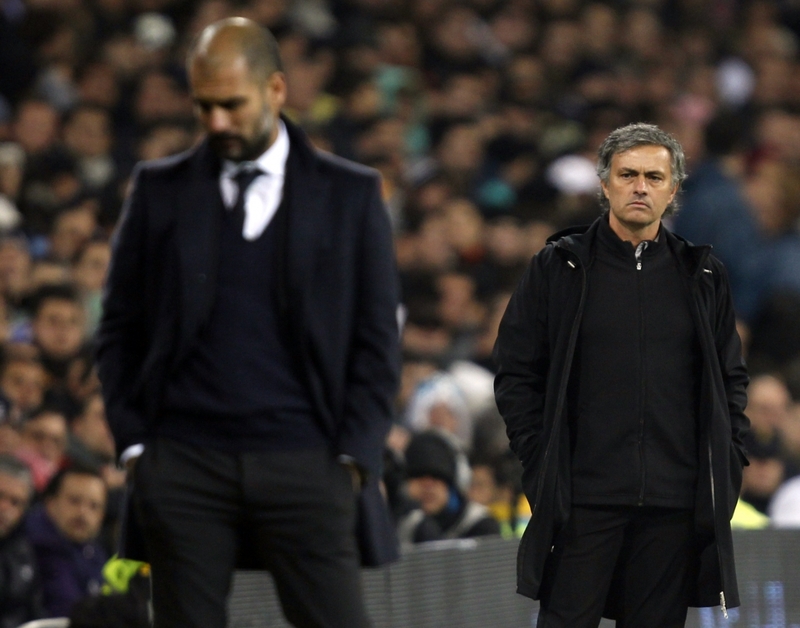 For comparison both Pep Guardiola and Mourinho charge much more than what Wenger does. Tell me after two seasons of Mourinho, is it worth it? Is Pep Guardiola as good with the A grade teams like us as he is with AA teams like Barcelona and Bayern Munich? I do not think so. No manager could have done what Wenger has done for the club and kept quiet about it at the same time. When we needed CL qualification to stay financially safe, he did not pressure the fans with that knowledge, he kept it to himself and took the bile from all angles. Even with Kroenke at the helm, he has managed to spend big on players when he has needed to and if the claims in the comments section were true that would not have happened. For all of us there comes a time when we realize some things are simply not working out, and some of us make that realization faster than others. Whether it is time for another round of renewed success at the Emirates, I think he knows, Arsene Wenger, that if there is a time to go, it is now. Whether it is time for his team to go ahead and win him some vindicating titles, or it is time to walk into the sunset himself. It is best to leave the decision to him and worry only about supporting the team. In the end it all comes down to what you think Wenger stands for. Is it money, greed, lust for power and inability to walk away from the past? Or is it sportsmanship, fair play, class, the pursuit of perfection and the right way of doing things? I, for one, believe that for Wenger himself it has always been the latter. The possibility of turning sport into art appreciable by all society, to bring a smile through the very mention of the team he loves and has built up through hard work, that has driven him on for so many years. 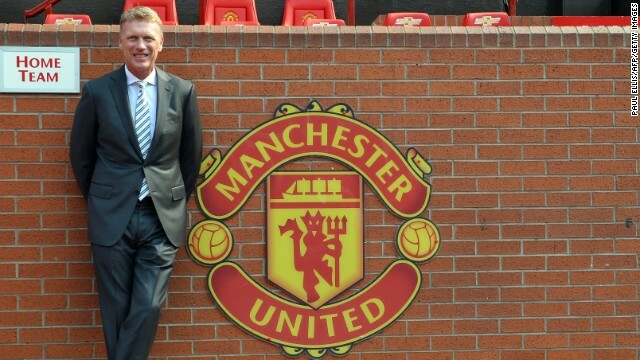 He will never be Ferguson with his 13 PL titles. 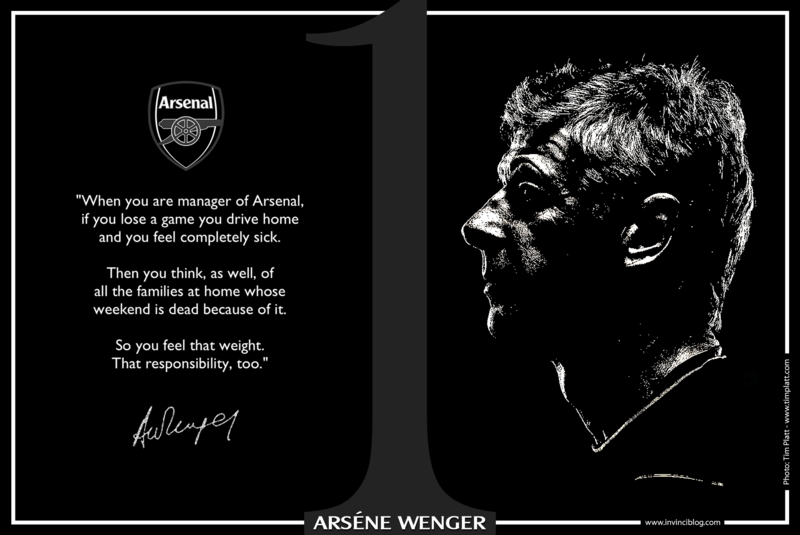 He will always be Arsene Wenger, the man who believed that in sport it is not always about winning. Sohum Sen is a half Bengali-half Gujarati Gooner from Kolkata, India. He lives the highs and lows with Arsenal and has a soft spot for Wenger. The things he loves most in the world are as follows- his little sister, his girlfriend and the Arsenal. Always available for a good debate, he fancies himself as a bit of a philosopher and as a tactician. He happens to be studying for a degree in Electrical Engineering, while simultaneously dreaming of writing a blog. He hopes to be a ST holder one day. I am very grateful for your kind comments. Civilised debate is always a pleasure. In regard to the remarks I made regarding the possibility of an alliance between Arsene and Kroenke, I am not making excuses but I have to apologise because my comments were in reply to one made by another contributor which I mistakenly thought was an addendum to yours, and since I do not have his permission, I cannot mention his name. However, on foot of his comment, I did some research on Kroenke and if you even look at the entry in Wikipedia, I think you will find that there is a history revealed of ignoring the wishes of fans in his other ventures mostly in the NFL. There is also 9 according to Wikipedia ) a clear and present history of non-achievement. he makes decisions, simply on the profitability of his venture and because the owners of clubs actually buy the franchise for them, they can move them to any geographical region they wish to without any apparent reference to the fans. He cannot be criticised for that because he is basically a predator feeding off something which happens to be a football club and which is dear to the hearts of its fans. His decisions are not predicated upon the love of the club and therefore he has not broken any moral code or done anything which would attract condemnation. Given that Arsene possesses all of the finer qualities which you have described, it is inevitable that he will be tarnished with the suspicion that he does in some way, condone or assist in providing Kroenke with the end result which he desires i.e profit. My criticism of Arsene is always tinged with regret. I have many times praised him for what he has done and my blogs have done that consistently. Notwithstanding that, I am also consistent in saying that he is arrogant now in a way that he was not 10 years ago. He is arrogant because he is repeating the same mistakes over and over again which have only come to light because he now has a team which could compete with the best, but cannot, because he will not accept advice. He did not need that advice when he kept making the right decisions but other managers have caught up and overtaken him and he refuses to see that. He is not stupid by any means. The press respectfully refer to him as the professor with good cause and therefore it is hard to attribute his stubborness as anything other than arrogance. A civilised conversation this is and i am extremely happy this has come to light here. before i go any much further, let me say proudly, and with a bit of arrogance….WENGER OUT…I say this because the legacy he built is starting to fall apart. He is no longer the genius he used to be. He has been found out by other managers and the world in general. His arrogance to change tactics, listen to advices and particularly make informed decisions about some players beggars belief, in fact, it stinks. i am not and will i ever be a supporter of a man being allowed to take millions of fans for fools. i am not a man that thinks another man should have a job for life or that we are doomed without Wenger. This is the kind of mentality that has stagnated the club for many years. do you know how many people live in this world of ours? how many football managers that have tasted more success than Wenger in a spectacular fashion but still get chucked out by their club for one or two poor performances? Wenger betrayed David Dein, the man that brought to promote his position and further enhance his dominance. David Dein would have made him a better Manager than he is today. We would not have gone 12 years without any Trophy if Dein was still around. David Dein is the only man that speaks and Wenger listens. Wenger should have stood up for Dein when the dirty politics of the Board started. Dein brought Kronke because he wanted us to be able to compete with the likes of Man Shiity and Chelski…..He would have forced Kronke to honour his promise of spending big on the club. Wenger stood by and let the Board treat Dein as they wish so that he could rise to prominence within the Arsenal Group. Have you ever wondered why Usmanov, the richest guy of them all is not given any chance at all? Dein brought him to us too remember? Why would a manager not want somebody that clamour for glory and willing to spend his own personal money or the team as suppose the parasitic Kronke that steals form the club? The answer is simple and straight forward, Wenger knows the pressure of winning will get to him as failure to do so with Usmanov financial backing will end his reign at the club. It is not in his CV to make money for the club. His main job is win football matches and turn us into champions…16 Years of champion’s league qualification without a single success is an abject failure. 12 years of stagnation because of the path Wenger choses is an aberration. Now, let sit back and enjoy Wenger’s immunity put to shame by Leicester city. It would be a an indictment on him if they end up winning the league. What would Wenger’s excuse be? He has not won it in 12 years, and Leicester are having a proper go at it at their second attempt. Oh, i can’t wait to hear what the excuse will be this time around if it happens. i pray it happens. i want our club to be free from the clutches of stagnation and arrogance on the part of Wenger. The only gift or the best he could possibly give to this great club of ours is for him to walk out at the end of this season, win or lose. it is time for new challenges and heaven knows the time is now. You are obviously a committed Arsenal fan and from what I have read, a very disillusioned and hurt fan. That is sad because we all want to enjoy the club we fell in love with. I too regret the demise of David Dein, but I cannot comment on the situation which brought it about. I know that he was responsible for Arsene`s arrival but I am not privy to the politics in the boardroom regarding his departure so I cannot take a view. I do understand however that Dein and Wenger have remained friends and therefore I have to assume that they have settled whatever personal issues there may be. In my mind given the choice of Dein or Kroenke for Arsenal, it is a no brainer. Aboy, if usmanov is so willing to spend his personal cash, what’s stopping him from doing so? Forfeiting his dividends and giving them back to the club or giving the club a loan?